In a recently published study, there was a claim that nearly three quarters of executives do not understand Buyer Behavior1. What an interesting statistic. While the area of study around buyer behavior remains a hot topic, there doesn’t seem to be a proportionate amount of interest from those who should seemingly care the most – the C-Suite. Sadly, I wasn’t surprised. Customers are quite possibly the most important aspect of any business, and we simply do not spend enough time or energy understanding what they do and why they do it. Just to be clear, the lack of time and investment in understanding buyer behavior doesn’t end with the C-Suite. Aside from the customer facing team, most functions struggle to understand the customer and why they choose their company to provide value and why these customers continue to purchase their goods and or services. From the top to the bottom, buyer behavior should be engrained into the entire organization as it represents the singular driving force behind the purchase process. With it comes the key to understanding many performance metrics and, ultimately, the levers to increase bottom line results. The perils of overlooking buyer behaviors are many. By not understanding our customers’ behavior, values, and negotiation styles, our sales teams become ineffective at selling, fall victim to Procurement’s pricing buzz saw, and margins become thinner and thinner. There is a secret to overcoming this lack of understanding and it is surprising simple. Consider a tailored offering of products and services that can have a profound impact on the market. Through the process of mapping certain behaviors, we begin to understand customers’ appetites for things like value, service, and, most importantly, price. Entirely too much time and too many resources are spent on customers who do not truly want or need all the extras you offer to get the deal. They serve as the ultimate distraction. What could your margins look like, if you eliminated the less profitable deals associated with these customers? Customer analytics bring a clear understanding of buyer behaviors to tell the full story. Think of customer analytics as the building blocks and the understanding of buyer behavior as the glue that holds it all together. 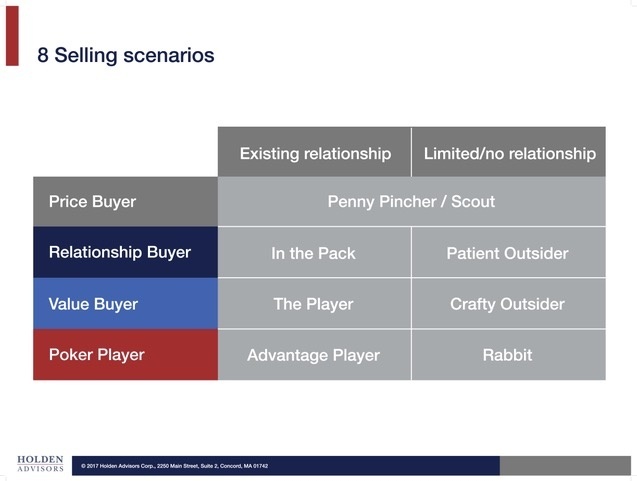 Then, map your selling scenario within those buyer types, and toss out the ones that you have little to no chance of winning. Diagnosing buyer behavior does not require a PhD in the science of selling. Negotiating with Backbone is a set of strategies and tactics that everyone in your organization, especially executives, can employ to improve the understanding of buyer behavior, eliminate unprofitable customers, and improve margins—immediately. We’d love to send you a tool that you can use to help diagnose buyer behavior in a live deal. If you are interested in understanding your customer’s buyer type “tells” please click below to request the tool.